Glasgow 2014 organisers have promised more shuttle buses to avoid delays that marred the first day of athletics at Hampden Park. 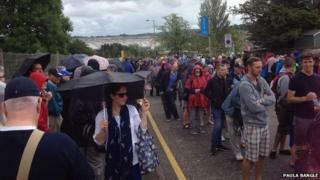 Hundreds of spectators waiting at park and ride centres missed the start of proceedings on Sunday afternoon. And there was further frustration as large queues formed at the turnstiles and streets around the stadium. Glasgow 2014 Transport Programme Board co-chair Brian Devlin said it was reviewing its event arrangements. "There were some delays with buses from the park and ride sites to some venues, but we managed to commission more buses and people did get to where they wanted to be," he said. "We want to thank everyone who waited patiently and in good spirits as Hampden had a slower than anticipated start. "But, once up and running, queues moved quickly and around 30,000 spectators were in for the first race. "We will have our resources in earlier tomorrow and we have strengthened our transport plan and resources by adding additional capacity." But Mr Devlin pointed out the logistical problems involved on what organisers described as "Super Sunday", which included the morning marathon through the streets of the city. "This has been a massive weekend of sport and festival in Glasgow, the city's largest ever," he said. "Over the last two days, Glasgow Central Station alone has had the equivalent of the entire population of Glasgow pass through it. "Almost 700,000 people have visited the city over the weekend and 1.3m journeys were made by road and rail through the week. "An estimated 30,000 people took to the streets to cheer on the marathon athletes and Glasgow Green live site recorded a bumper 39,000 people over the course of the day. Almost 40,000 spectators cheered on the Scotland versus England rugby sevens match at Ibrox." Mr Devlin stressed that, although the busiest days of the Games had now passed, the public should continue to "bear in mind the additional pressures on the transport networks" and that queues might still be experienced at popular venues and events. Athletics fan David Fuller told BBC Scotland shortly after competition at Hampden began at 14:30: "We got to the park and ride about 1pm and have only just got on a bus now. "We have travelled up from Worcestershire and we have been left cold and miserable." Problems emerged the morning after Glasgow 2014 chief executive David Grevemberg warned the public to give themselves plenty of time to travel to venues on what he said would be the busiest spectator day ever experienced by the city. The main problems appear to have been at the park and ride facility at Silverburn Shopping Centre, just off the M77 in south Glasgow, where marshals reportedly told angry ticket holders: "We don't know what's happening." However, Games Travel 2014 also tweeted: "Extra buses on the way to Hamilton and Eurocentral. Apologies for the delay. Hopefully you'll get moving soon!" Mr Fuller said: "There were about 1,000 people in the queue getting annoyed and despondent. "Organisers were sympathetic but said there similar problems yesterday. It is a bit of a downer." Diane Williamson, from Derbyshire, had travelled down from Tyndrum, north of Loch Lomond, with her family but found herself waiting in the queue at Silverburn for more than an hour and a half. "It looks like we are nearing the front of the queue now," she told BBC Scotland shortly after 14:00. "But there's lots of people behind us and they're not going to get to Hampden for the 2.30pm start. "A lot of people have paid a lot of money for tickets and come a long way to see this." One tweet said: "This is #glasgow2014 Travel Demand Management? Sell 500 car tickets for 1500 people & we've seen 4 buses in 40 minutes. "After one hour of queuing this is the sixth bus at Silverburn P&R! Absolute disgrace." Sarah Parry tweeted: "Whoever planned this one entry only access to a national stadium should never work again. #hampden #Glasgow2014." Road closures associated with the marathon began at 03:00, but Games Travel 2014 tweeted at 18:00 that most of those roads had re-opened. The bus problems came as organisers said they had received praise from spectators for the warm and friendly welcome from the 15,000 Clydesiders volunteers. Head of Games workforce Valerie Mitchell said: "We have received some brilliant feedback from everyone we meet on how amazing our Clydesiders have been. "The volunteers certainly make the Games. They are the heart of the Games and are the friendly faces you see everywhere you go. "Without them, we just couldn't put on this great sporting event."